You may not be shocked to learn that most of the delegates stayed at hotels owned by Jesse Jones, the Lamar and the Rice. But it is a bit surprising that some of them wound up in the residence halls of the Rice Institute. You’d have to believe that it was a tad uncomfortable in there in late June and Rice was a pretty long way from the new Sam Houston Convention Center downtown. This letter from the secretary of the housing committee, along with the agreement itself, turned up in one of the “Sundry Contracts” boxes in the collection of old deeds and leases. Several things about the letter are interesting, apart from its content. First, it is addressed to the Rice Institute at the Esperson Building. The business office moved around from time to time and tracking its location is interesting to me, for no particular reason that I can think of. It stayed in the Esperson Building for a long time, although it did move within the building. Second, it is sent to the attention of Mr. Frick and I’ve never heard of him before. 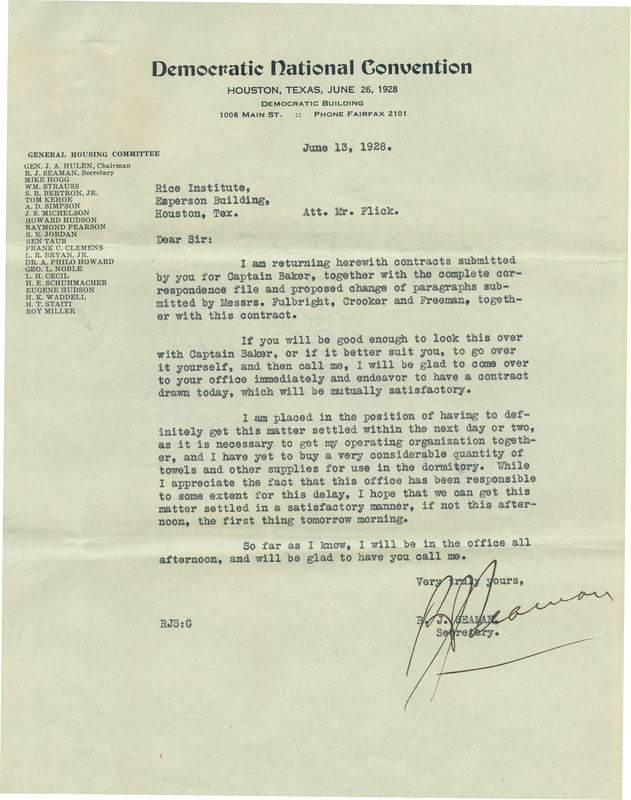 Finally, the delegates would begin to arrive less than two weeks from the date of this letter! Talk about cutting it close. Conventions require more than housing, of course. Entertainment is high on the list as well. 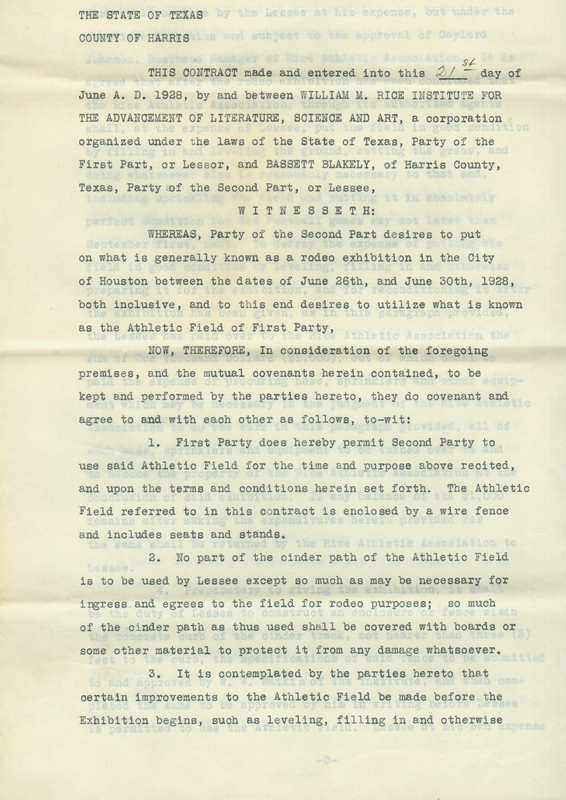 The Institute stepped up here too, leasing out its athletic field on Main Street for the staging of “what is generally known as a rodeo exhibition.” This long contract, also found in “Sundry Contracts,” lays out a series of explicit provisions for the protection of Rice’s facilities. The rodeo seems to have been a success. It got some press coverage and it’s mentioned in several reminiscences of the convention. My favorite one is here: the recollections of Garland Hayes, one of twelve boys from Tyler County who were brought to Houston for the convention as guests of John Henry Kirby, the wealthy Houston lumberman who was also a native of Tyler County. For more on the 1928 Convention generally, there is a nice entry in the Handbook of Texas Online.